In an address broadcast on the Internet this evening, Dominica's Prime Minister, Roosevelt Skerrit, stated that his government would continue to issue diplomatic passports to foreign nationals, in a program where six of the recipients have been arrested, one for violating international sanctions implemented due to Iran's illegal nuclear weapons program. Skerrit claimed that he would increase due diligence for all future applicants, but did not commit to terminating the unknown number of diplomatic passports currently in the hands of career criminals, or potential terrorists. The lucrative fees are now trumping common sense in Dominica, as the Skerrit government tries to take the money, irrespective of risk, and run. In an effort to explain Dominica's need for the reported multi-millions received for diplomatic passports, the Prime Minister claimed that the money received went to support the country's numerous embassies and consulates abroad, which appear to be far in excess of what a small, agrarian island nation requires to look after its citizens overseas. Rumors of unaccounted for and missing multi-millions, paid in by applicants to the diplomatic passport program, continue to upset the people of Dominica, who have demanded the resignation of the PM and his entire cabinet. Until and unless the global banking industry has a true and complete list of all diplomatic passports issued to foreign nationals, those individuals, who Skerrit now admits were not properly vetted, pose a dual threat: they could be used to perpetrate major financial crimes, or to finance terrorism. 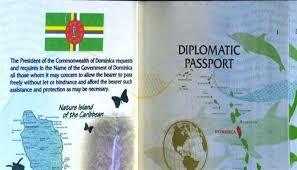 Since Dominic's government thinks that the money is more important than the safety of legitimate international business, and to interdict those who facilitate the financing of terrorism, compliance officers, now not knowing who any Dominican passport holder really is, must increase Country Risk for Dominica to high.